A nourishing face & body mask which improves skin texture and boosts skin renewal & hydration. 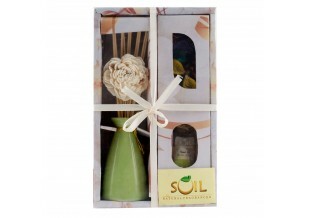 Natural aroma oils soften skin and give it a natural glow. In case of mature skin, it also counteracts ageing signs by tightening the skin and giving it an uplifting effect. Gold Mask: After cleaning apply appropriate quantity in soft circular motion in upward strokes and form a smooth layer. Leave it on for 15-20 minutes. The mask hardens on drying and cracks. Wash it off thoroughly and pat dry. Wash with harder splashes to reduce or remove the gold shimmer.